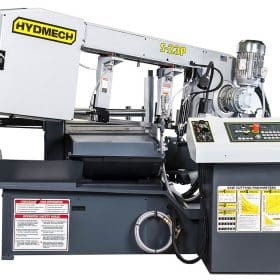 The DM and M-series Saws are some of the most compact that HYDMECH offers. 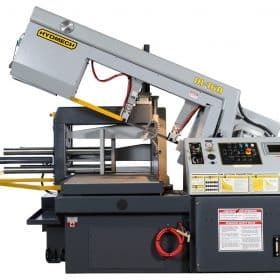 They are versatile, metal cutting miter saws designed for multiple medium duty applications in a variety of industrial and production environments. 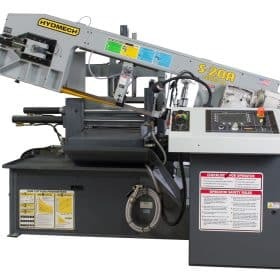 These are fully hydraulic, heavy-duty scissor-style metal cutting band saws that withstand the high demands of metalworking machine and steel fabrication shops; capable of easily cutting tubing, channels, angles, solids and light to medium grade alloys. These metal cutting miter band saws will increase flexibility and improve efficiency in any general purpose sawing application. HYDMECH S-Series band saws are perfect for any shop looking to make extremely accurate, straight or miter cuts. The DM-10 Double Miter Bandsaw has an exceptional cutting capability. This versatile saw saves operator set-up time and its compact design makes it ideal for use in tight working spaces. Its cast iron head and vises are designed for rigidity – absorbing vibrations and ensuring accuracy during cutting. A rotating table with single cut line allows head and blade groove to move together for smooth, accurate mitering. The DM-1318P double miter, semi-automatic band saw provides exceptional miter cutting for medium duty applications. Featuring a 13″H x 17 3/4″ W capacity at 90°, 5.5 HP motor, and 1 1/4″ blade, the DM-1318P is a versatile double miter band saw. 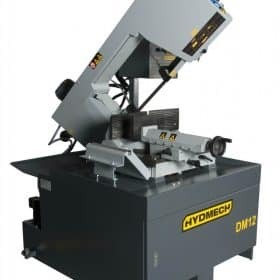 HYDMECH M-16A Automatic Band Saw provides exceptional miter cutting capability for heavy-duty applications and is ideal for use in tight working spaces. With the ability to miter from 90° to 60° and featuring a 16″H x 25″W capacity at 90°; makes this band saw a reliable choice for your heavy-duty metal cutting applications. This Pivot-Style band saw provides exceptional miter cutting capability for multi-shift, high production metal fabrication shops. 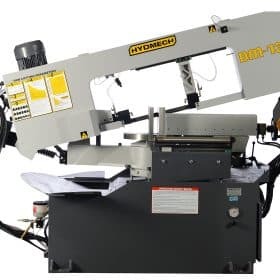 HYDMECH’s M-20A Miter Cutting Band Saw is a heavy-duty automatic scissor style band saw capable of providing exceptional cutting performance on a variety of materials. 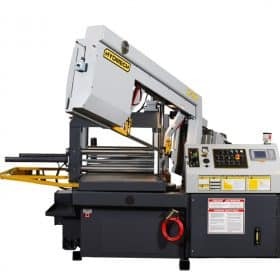 Its ability to miter cut from 90 to 60 degrees and the standard 10HP direct blade drive allows for a wide range of available band speeds makes it an excellent machine for large fabrication jobs. A powered blade brush works to clean the blade while removing chips from the automatic chip auger. HYDMECH’s S-20 Manual Miter Cutting Band Saw was the first band saw to incorporate a swing head design for miter cutting. These innovations have been at the core of the HYDMECH trademark. These versatile, scissors-style machines are designed for multiple light/medium duty applications and are ideal for use in tight working spaces and cutting tight angles into a variety of materials. This band saw features a 13″H x 18″W capacity at 90°, 3 HP motor, and 1″ blade, which makes this a versatile metalworking machine ideal for metal fabrication shops. 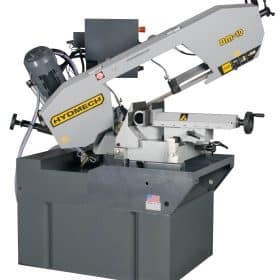 The HYDMECH S-20A Automatic Miter Band Saw features wide range of options and accessories making this metal cutting band saw a valuable piece of machinery in any fabrication shop. Featuring a 5HP variable frequency drive system that provides an infinitely variable band speed from 75-350 sfm. The standard PLC control enables the operator to program up to 1000 jobs with 100 jobs in queue. 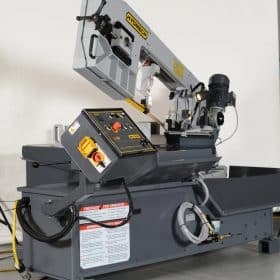 The large 10 gallon coolant tank, overhead bundling, and an out of stock switch makes this band saw an excellent choice for a lowest-cost-per-cut solution. 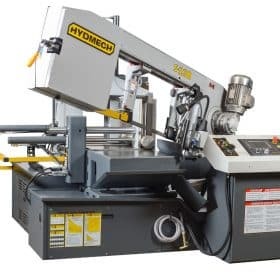 The HYDMECH S-20P Semi-automatic Miter Band Saw features a swing head design and provides exceptional miter cutting capability for light to medium duty applications. 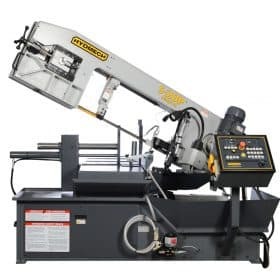 This bandsaw features a 13″H x 18″W capacity at 90°, 3 HP motor, and 1″ blade and is a versatile semi-automatic scissor style band saw ideal for use in metal fabrication and metalworking machine shops. The HYDMECH S-23A Automatic Miter Band Saw features a powerful variable frequency drive providing smooth operation and infinite adjustment from 50 to 350 sfm. With the ability to perform miter cuts from 90° to 60° and features a 16″H x 20″W capacity at 90°, 8.8 HP motor, and 1 1/4″ blade, this automatic scissor style band saw is built solidly to give you maximum productivity in all environments. This band saw is an ideal solution for metalworking machine and metal fabrication shops that require clean and precise metal cutting machines. The HYDMECH S-23P Semi-automatic Scissor Style Band Saw is an exceptional piece of metal cutting equipment. With one hydraulic full stroke vise, and a direct down feed option that provides easy adjustment of both feed force and feed rate, these standard innovations from Hyd-mech make this an indispensable tool for every metal fabrication shop.